Kickapoo Coffee is on East Erie Street, across the road from the Milwaukee Institute of Art and Design. The building, a single-storey, glass-fronted affair on the north side of the street, is hard to miss. There’s an additional open space to the right with several low, broad wooden benches/platforms which, I think, is public outdoor seating. Kickapoo itself, meanwhile, has more traditional outside seating, segregated from the pavement, with a long, wooden bench running along the front of the store, split into three bays, each with a pair of square two/three-person metal tables. The entrance is on the right, where a single glass door leads down a short, glass-walled corridor to a second door at the back, which in turn leads into Kickapoo proper, a large, open, high-ceilinged space. The counter is off to the left, towards the back of the store, with the bulk of the seating between it and the windows. Starting to the left of the door, there’s an L-shaped bench running along the inside of the corridor and then a short way along the front window. This has a pair of two-person tables and then a larger one at the bottom of the L by the front window. Continuing along, an eight-person window­-bar runs nearly the full width of the store, ending just before the left-hand wall. Here there’s more seating, a U-shaped bench at the front with a low coffee table in the middle and, behind that, an L-shaped bench backing onto it with another coffee table. The remaining space, behind the window-bar, is occupied by a central, long, narrow, 12-person communal table. There’s then a large gap between the seating and the counter, leaving plenty of space for those who have ordered their coffee to wait to collect it (yes, Kickapoo suffers from the American disease of counter-service). Finally, there’s more seating behind the counter, with three high, two-person tables against back wall, while a row of eight bar-stools lines the rear side of the counter itself, with three more along the back corner. The counter, by the way, is an interesting affair, almost an island, projecting from the left-hand wall, but tapering by 45⁰ to a point at the right-hand end. This is where you’ll find the cakes and till, the 45⁰ angle meaning that they’re facing the door. This is mirrored on the back wall, where the right-hand back corner is cut off at 45⁰. This angled section holds the retail shelves, with the menus above them, ideally placed to the right of the till. After ordering, there’s a natural progression along the counter, past the three Kalita Wave filters for pour-over, and on to the EK-43 grinder, the twin Mythos 1 espresso grinders and a three-group La Marzocco Linea espresso machine. Rounding things off at the far end is a two-headed self-service tap, offering still and sparkling water. Kickapoo roasts all its own coffee, with the single-origin options on espresso and pour-over changing on a roughly monthly basis. After a quick chat with the barista, I decided to go with the single-origin espresso, an organic Guatemalan Concepcion which she described as “interesting” and “complex”. If there’s a single-word description of coffee that will always get me going it’s “interesting” (and “complex” is not far behind). Pulled short in a classic white espresso cup with an oversized handle, my espresso more than lived up to its billing, being both complex and interesting, although, as usual, my limited palate/vocabulary can’t really do it justice. It seemed to me that pretty much every sip was subtly different, with a variety of fruity flavours present. 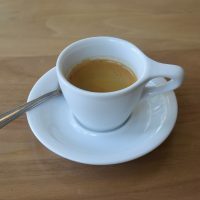 December 2018: Kickapoo Coffee, Milwaukee was a runner-up for the 2018 Best Espresso Award. This entry was posted in Breakfast, Cafe/Roaster, Cafes, Cake, Coffee Terraces, Island Counters, Laptop Friendly, Lunch, Milwaukee, Retailers and tagged include, Kickapoo, Midwest2018 by Brian Williams. Bookmark the permalink.